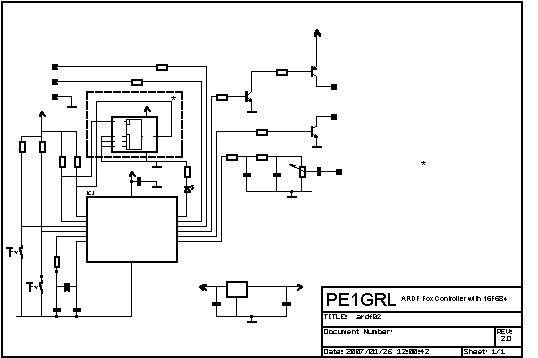 The ARDF controller was created after a request to be able to play random audiofiles for an ARDF transmitter, most existing designs were based on an 16F84, a somewhat aging design and better controllers are currently available. Also most controllers had a 5-10 mA current drain which can be improved, this design requires less than 400 uA.. To allow a very small controller footprint and flexible configuration the timer is not configured with (dip) switches but via a serial connection and a host PC. The memory option is optional and is only required for a wave file playback, all other options (CW, Single Tone, Tone Sequences and Audio Effects) do not require the I2C memory chip. 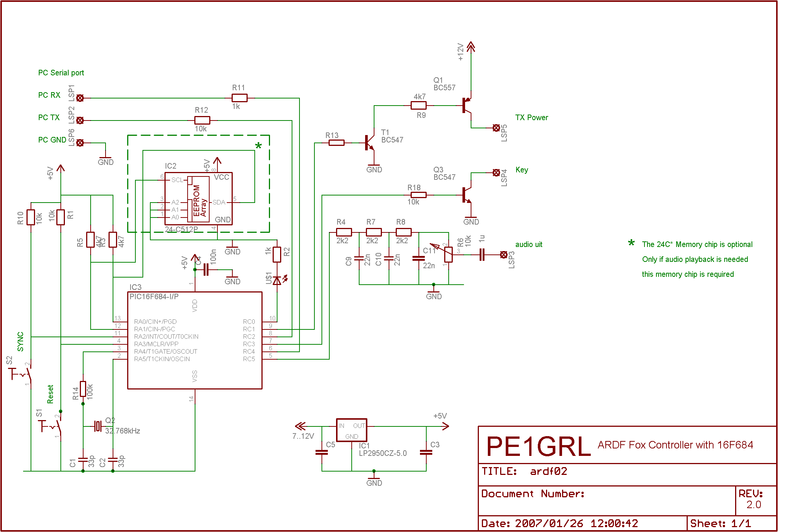 Based on a 16F684 PIC microcontroller. Adjustable delay before the transmitter becomes active..
An "Autoshutdown" after a specified time to prevent battery drain. The controller controls the power/ptt lines and also generates a selectable modulation signal. - a .WAV audio sample (requires an I2C memory chip to store the waveform). Options to send MO/MOE/MOI or random CW signals. CW speed adjustable from 5 to 30 WPM. Cycled transmission where the number of transmitters is selectable. The interval time is selectable in 10 second units. Very low power consumption: < 300uA when the transmitter is idle, < 5mA when the transmitter is active). All options are configured via a Windows Setup program. Multiple controllers can be synchronized via an external connection. 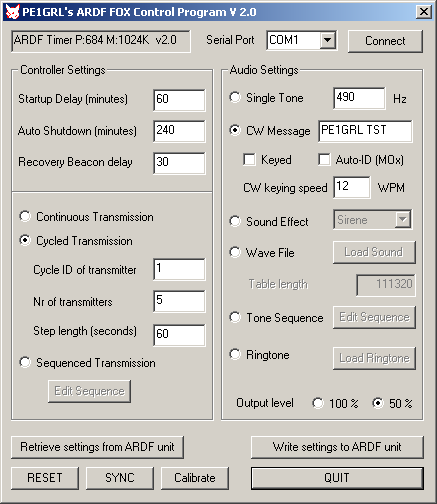 The ARDF timer/controller is configured using the ARDFCF utility. Click the image for a detailed explanation of all the options. Click on the image for a large version. This line is used to synchronize multiple transmitters, the line should be held low for at least 500 milliseconds and synchronisation starts when the line is released. This line will enable the supply to the transmitter (supply side switching), R9 and Q1 determine the maximum current which can be switched. If the transmitter current is less than 100 mA a BC557/4k7 combination can be used. For up to 200 mA use a 2N5401/2k2 combination. Using a BD136/138/140 with a 470 ohm resistor will allow switching of currents in excess of 1A. The power is applied 100 milliseconds before the first transmission occurs, allowing the oscillator to stabilize. The modulation is available on this pin, the maximum output is 2Vtt and with R6 the requested level is set. Audio tones are created with a Software DDS and generate sinusodial signal. the led will also come on. During "inactive" periods the led will briefly flash every 2 seconds to show the system is running. After a reset after a succesfull initialisation the led will flash briefly for 2 or 3 times to indicate the system is awaiting serial commands or a SYNC pulse. 3 flashes are given if external memory has been detected, 2 flashes if no memory had been found. 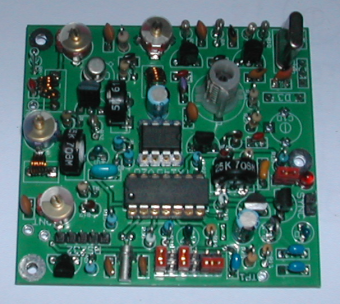 Paul, PA3DFR, created a complete 2 Meter ARDF AM/FM transmitter with this timer which fits on a 64*73 mm PCB.